AIKOKU ALPHA cold-formed auto parts, which have won numerous quality awards and other accolades, are used by automakers in Japan and around the world. 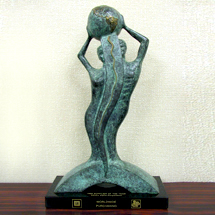 GM presented AIKOKU ALPHA this award from among its 30,000 suppliers for outstanding overall performance throughout the year in quality, technology, price, and service. 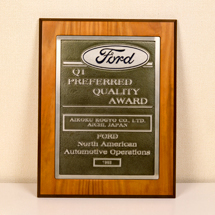 Only 181 companies in 22 countries received the award in 1999—and AIKOKU ALPHA was one of five such companies in Japan. The award specifically recognized AIKOKU ALPHA’s high-quality turbine shafts and sun gear shaft forming, and the company was further acclaimed for its cost reduction efforts upon signing a three-year contract with GM. Q1 stands for “quality number one”. Our whole division worked as a team to produce a quality manual to boost quality. As a result of these efforts, we put together a quality management system over the course of two years and were awarded for our efforts. We improved quality, created a basic manual, and laid the groundwork for our future QS-9000 certification. One of the most important properties of turbine shafts is durability. The reliability of our testing equipment has been certified after undergoing stringent inspection precision and testing method standards based on the GM test manual. 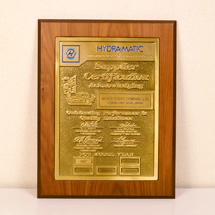 AIKOKU ALPHA was the first company in Japan to receive this certification. Our vacuum technology was established as a result of this turbine shaft.